This system can be used for any php script, forum, shopping cart, cms, etc. Anywhere custom modifications are made for reuse. The logging option is invaluable for debugging understanding exactly what is happening. After the initial class load, the mod can actually use a script to mod itself into other core files that do the actual includes for other mods. This is the first and only known method to allow the ability to test multiple mods without actually changing files. That is what official vQmod page says on Githab. But there is a bad thing about vQmod. To my mind vQmod is the biggest evil for OpenCart. I can say it after more than 2 years of working with OpenCart and vQmod. I've created several dozen modules for OpenCart and I've fixed, maybe more than hundred conflicts and more than half of these conflicts were vQmod conflicts! If you have 2 vQmod files that change the same OpenCart file in the same place.. You probably will get conflict with high probability. 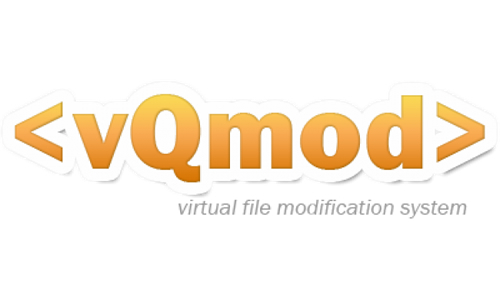 Because vQmod uses bad way to modify core file. Right way to do this uses for example Drupal - it has hooks system or Symfony - it has an Event system. And when 50 Drupal modules use 1 hook probability of conflict is less than 1%. Basically because of vQmod OpenCart is very hard to use in big projects with many code modifications. The good thing is that OpenCart creators know this. That is why in the OpenCart 2.0.0.0 we can see Events as a better modification system. And I hope that once OpenCart will refuse of vQmod at all and will become a really good CMS Shop. Advantages and disadvantages of the OpenCart.